Oregon State University Dietetic Internship (OSUDI) intern Paige Becker is the latest recipient of a prestigious scholarship – the Academy of Nutrition and Dietetics Scholarship. “For an intern to get one of these scholarships is noteworthy, as they go first to graduate students, which she is not,” says College of Public Health and Human Sciences Associate Professor Mary Cluskey, who serves as director of the OSUDI Program. Oregon State University Dietetic Internship intern Paige Becker is the latest recipient of a prestigious scholarship – the Academy of Nutrition and Dietetics Scholarship. Photo courtesy Sándor Lau. 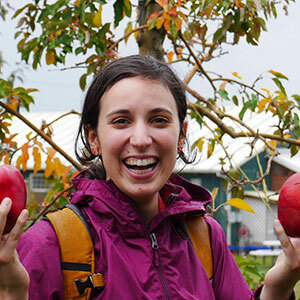 Paige, who began the OSUDI Program in September, moved to Portland after earning an undergraduate degree in Nutritional Sciences with a Dietetics option from Pennsylvania State University – University Park campus. 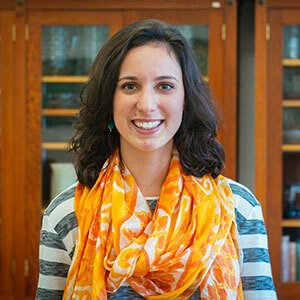 She is one of 12 dietetic interns at Oregon State. Housed in the College of Public Health and Human Sciences, the accredited OSUDI program is a nine and one-half-month, full-time supervised practice program that focuses on long-term senior nutrition care and community nutrition. It features experiences in traditional venues such as clinical nutrition care, food service, management and community nutrition education and counseling, and includes six or seven rotations in various health care settings under the supervision of qualified registered dietitian/nutritionist preceptors. “Some of them include physicians offices – patient centered medical homes, hospitals, community nutrition, public health sites and WIC programs, school lunch programs, nursing homes, OSU campus food and nutrition programs including Student Health Services, University Housing and Dining Services and more,” Mary says. Internship preceptors develop unique opportunities for students to learn in a combined experiential and structured environment. Selection is competitive and based on grades, leadership and campus engagement as undergraduates, work history, recommendations and interviews. The OSUDI is a non-credit, non-degree, post-baccalaureate program, and upon successful completion graduates are eligible to take the RD registration exam. “I have learned so, so much already,” Paige says. “When I was at a site that does not employ a registered dietitian, I served as the nutrition expert. Having to throw myself into appointments without a preceptor to guide me was an amazing learning experience. At first I felt a bit out of my comfort zone, but by trusting my education and accepting that I would make some mistakes, I was able to stay calm and quickly became much more comfortable counseling patients. And now, after four years of classwork and tests, I finally am experiencing why I chose this profession.